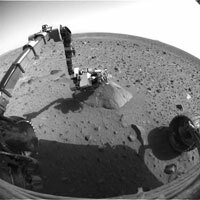 This image from Spirit's front hazard-avoidance camera shows the robotic arm extended to the rock called Adirondack. NASA's Mars Exploration Rover Spirit is healthy again, the result of recovery work by mission engineers since the robot developed computer-memory and communications problems 10 days ago. "We have confirmed that Spirit is booting up normally. Tomorrow we'll be doing some preventive maintenance," Dr. Mark Adler, mission manager at NASA's Jet Propulsion Laboratory, Pasadena, Calif., said Sunday morning. Spirit's twin, Opportunity, which drove off its lander platform early Saturday, will be commanded tonight to reach out with its robot arm early Monday, said JPL's Matt Wallace, mission manager. Opportunity will examine the soil in front of it over the next few days with a microscope and with a pair of spectrometer instruments for determining what elements and minerals are present. For Spirit, part of the cure has been deleting thousands of files from the rover's flash memory -- a type of rewritable electronic memory that retains information even when power is off. Many of the deleted files were left over from the seven-month flight from Florida to Mars. Onboard software was having difficulty managing the flash memory, triggering Spirit's computer to reset itself about once an hour. Two days after the problem arose, engineers began using a temporary workaround of sending commands every day to put Spirit into an operations mode that avoided use of flash memory. Now, however, the computer is stable even when operating in the normal mode, which uses the flash memory. "To be safe, we want to reformat the flash and start again with a clean slate," Adler said. That reformatting is planned for Monday. It will erase everything stored in the flash file system and install a clean version of the flight software. Today, Spirit is being told to transmit priority data remaining in the flash memory. The information includes data from atmospheric observations made Jan. 16 in coordination with downward-looking observations by the European Space Agency's Mars Express orbiter. Also today, Spirit will make new observations coordinated with another Mars Express overflight and will run a check of the rover's miniature thermal emission spectrometer. Spirit will resume examination of a rock nicknamed Adirondack later this week and possibly move on to a lighter-colored rock by week's end. Each martian day, or "sol" lasts about 40 minutes longer than an Earth day. Spirit begins its 30th sol on Mars at 12:44 a.m. Monday, Pacific Standard Time. Opportunity begins its 10th sol on Mars at 1:05 p.m. Monday, PST. The two rovers are halfway around Mars from each other. The main task for both Spirit and Opportunity in coming weeks and months is to find geological clues about past environmental conditions at their landing sites, particularly about whether the areas were ever watery and possibly suitable for sustaining life.